To many progressive fans, Flash is best known as the band Peter Banks started after leaving Yes. 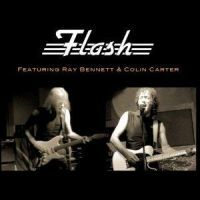 To form Flash, he teamed up with ex Camel singer, Colin Carter, Ray Bennett and Mike Hough. After 4 decades, Colin Carter and Ray Bennett have decided to bring back Flash, with the release Flash (Featuring Ray Bennett & Colin Carter). The album casually plods along at mid tempo for most of the time and you certainly understand where they're trying to go. They're trying to get a good groove going, like many bands in the 60s and 70s. The spirit of those days still seems to be with them, but however the inspiration is lacking. The grooves and rhythm are not getting the job done. They seem to be coming from a very tired band, unable to conjure much enthusiasm for their own music. I can't find any fault in the performance itself, which is skilled and professional. There a re a couple of high points – the cover of Nine Inch Nails' Hurt brings something new to the table and Morpheum is also a seriously good track. The rest contain some fine moments, but are for the most part not as good. There are some excellent guitar solos on this one, but with such extended pieces, you would hope to find a bit more compositional variety. As it is, most of the playing time is taken up by long, occasionally fine solos and pedestrian tempos. The vocal department is quite solid, though, with a CSNY feel. I think Carter and Bennett were trying to recapture the olden and golden days of Flash. While it's not a bad album per se, it is very rarely special or exciting. I hope the guys are a bit more imaginative and exciting with the next release, as I definitely hope they keep trying.